There has been a recent increase in the popularity of strength training for muscle building, but there is a benefit of working your muscles that many aren’t yet aware of, and that’s the incredible fat loss results that come from strength training. Strength training is one of the most effective ways of losing body fat that we know of. It has been proven that those that integrate strength training into their workout routine, lose more fat than those who only participate in cardiovascular workouts. Strength training is so effective at getting rid of body fat for a few reasons. It nurtures and builds the muscle mass you already have, preserving your muscle. Doing this while eating a calorie-deficient diet will allow you to lose fat. Another key finding is the connection between strength training and an increase in metabolism. Studies have found that a pound of muscle burns about three times the amount of calories that one pound of fat burns. Strength training will increase your muscle mass, thus allowing your body to burn more calories at rest. 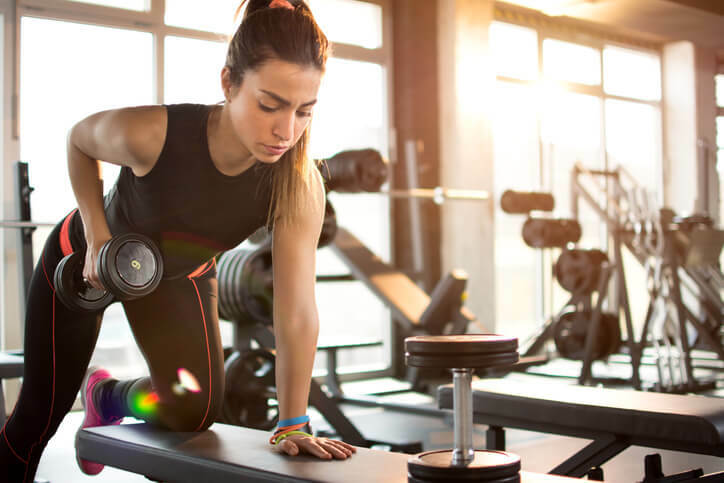 If you’re seeking to lose stubborn body fat, read on for a few tips on how to utilize strength training to get you to your goals. When you start planning out your strength workouts, try exercises that combine multiple muscle groups or muscles that stretch along multiple joints. This requires your body to put in more work, which increases blood flow and oxygen to muscles, ultimately resulting in a boost in your metabolism. The wonderful thing about utilizing these kinds of exercises is that your body will continue to burn more calories even after your workout is done. The quickest way to halt weight loss or derail a fitness journey is by getting an injury. Too many times we overwork the body to the point of injury. The key to strength training is to take it slowly. Be realistic about the amount of weight you are using and the number of reps you are doing. If you’re a novice to strength training, look for beginner workouts or simply listen to your body when in the gym. Remember that you won’t get to your goals by pushing yourself too hard. Slow and steady wins the race! The saying abs are made in the kitchen is incredibly accurate. Especially when it comes to losing a layer of fat to expose those abs. Combining your strength training routine with a clean, healthy, and balanced diet will only speed up your results. Everyone will need a different amount of calories and meal plans, but make it as simple for yourself as possible. By simply swapping out your daily dessert for a piece of fruit, you’re well on your way to healthy eating! Remember, with any change comes challenge and time. Let yourself off the hook if you slip up along the way and allow yourself a few treats. Going from 0 – 60 too fast will only result in frustration. Use these tips to help you lose fat and reach your fitness goals! We wish you luck along your journey! If you’re looking for great insight into nutrition or proper fitness, reach out to one of our nutritionists or trainers! We’re here to help!